It’s been a while since I shared any layouts. Seems I am only scrapping for classes these days. But when Vicki showed me her finished layout of her little granddaughter I knew I had to ask if I could share it. Vicki wanted this to be special, and it is. It will be framed with a black shadow box frame (so not to squish the plentiful layers of blossoms and gemstones). 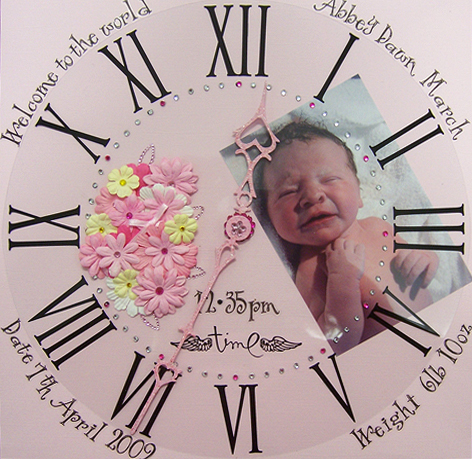 Love the Distress Stickles on the Scrap Fx clock hands too, which are set to the time of Abbey’s birth, and gemstones everywhere! Just beautiful. This entry was posted in Scrapbook Layouts. Bookmark the permalink. I would love to find out how this was done. I think this would be beautiful as a birth announcement. Can you find out and give me some direction on how this was completed. Was a cricut used?? Vicki used Pink Bazzil card as the base with a clock transparency overlay. 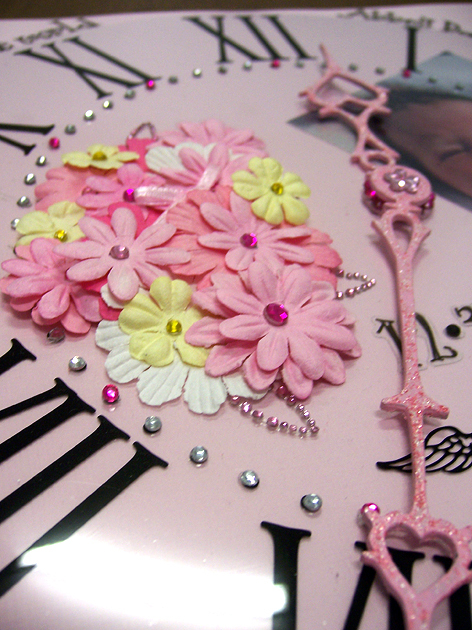 The clock hands are chipboard which she has glittered and the flowers are by Prima. Vicki added assorted stickers to show name and details. Contact me if you would like to order any of these products (or similar, some are now discontinued) on scrapbookhouse@westnet.com.au – Australia.